I cannot believe this came out of my kitchen. It’s quite possible I’m becoming a pie person. !!!!!!! I mean I know this isn’t legit pie. It’s not a real PIE pie. But it’s made with, like, pie crust. That’s the worst part of pie! Sometimes. So part of me didn’t even want to eat it. I didn’t want to share. I wanted to frame it in a shadow box and somehow preserve this and be all “um omg I made this one time” and tell stories about it because I have no life. And just because I’m not sure if it could happen again and again. I’m still in “give me all the fruit” mode. Loving it all and wanting it all. I seem to be in a phase of making a fruit dessert one week – and a ridiculous trashy chocolate one the next. It’s just happening. And I don’t even want dessert much these days. Depression. Pretty sure that this whole pie making this is some odd version of nesting for me. I haven’t really been able to nest in a real way since we are moving, so pie crust and baking it is. At least the people around me are thrilled. Galettes and/or crostadas are my thing – they don’t require the patience that an actual pie crust does – they don’t require making pretty edges or blind baking or any of that pie speak that makes my head spin. Basically it’s the lazy man’s pie. Please be a lazy man with me. This little dessert here is also ideal for you crazy people who don’t love super sweet and rich desserts. And I feel totally okay calling you “crazy people” because guess what? I am currently one of those crazy people. It is so weird. I can’t really deal with it. I always swore that if I ever got knocked up there was just nooooooooooo way my taste buds would change or that I wouldn’t want dessert. HAHAHA. Funny. Feel free to punch me in the face for thinking that I could control that. It’s just so cute I could eat it. Remove the dough with your hands and wrap it in plastic wrap. This dough makes enough for 2 galette crusts, so you can either separate it into 2 sections now, or separate it after it’s refrigerated. Refrigerate the dough for 30 minutes. Add the sliced peaches to a bowl. Stir in the grated ginger, distributing it as much as you can. Sprinkle the peaches with cornstarch, sugar, ground ginger and salt. Toss the peaches well and let them sit for 10 minutes. Remove one of the crusts from the fridge. (The other is good for another week or so, or it can be frozen.) Roll one of the pie crusts into a… “rustic” shape – no shape necessary really – until it is about 1/4 inch thick. Place the dough on a parchment-lined baking sheet. Layer the peaches in the center leaving a 2-inch+ border of crust. Once the peaches are layered, fold the crust over top of the peaches. Brush the crust with the beaten egg wash. Take the sliced almonds and press them into the crust. Sprinkle any of the exposed crust and almonds with sugar. Bake the galette until the crust and almonds are golden, about 40 to 45 minutes. Before serving, sprinkle with fresh mint leaves. Possibly silly question as I am neither a pie or galette connoisseur — do you think this could be baked ahead and served a few hours after the fact? Making it tonight for Book Club. (: Thanks! Whaaaaaaat?! This looks absolutely amazing! Almond and peach always is a win. Bravo! I had 6 ripe peaches in the fridge. This looked too fabulous not to try. I had all ingredients except the fresh ginger. I used a pre-made crust and am glad I let the peaches sit for 10 mins. I didn’t add all of the juice back in and wonder if I am sacrificing some of the starch. Hmmm? It is in the oven now…..
Wow! I love galettes but sometimes find they look a little blah. Blah be gone… Almond crust to the rescue! Thanks so much for this concept. I think it’ll be my go-to crust for all my sweet galettes! Do you use powdered, superfine or turbinado sugar to sprinkle over the almonds? The recipe doesn’t specify and it’s hard to determine from the pictures. i just used regular granulated white sugar! This galette looks so delicious and perfect for this time of year! I stink at pie crusts, but galettes are much more forgiving! 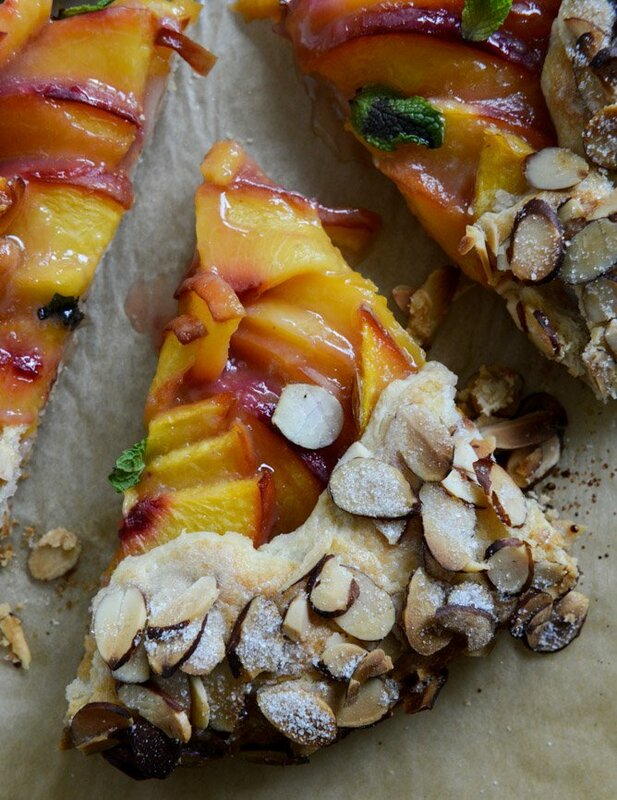 The almond crust is gorgeous and I can never get enough peach desserts! Such an amazing galette, and the crust makes it look like a bear claw! Absolutely gorgeous! I can’t wait to make this! The easiest pie you’ll ever make..plus peaches! That crust! I feel like I’m peering into the window of a European bakery…so gorgeous. 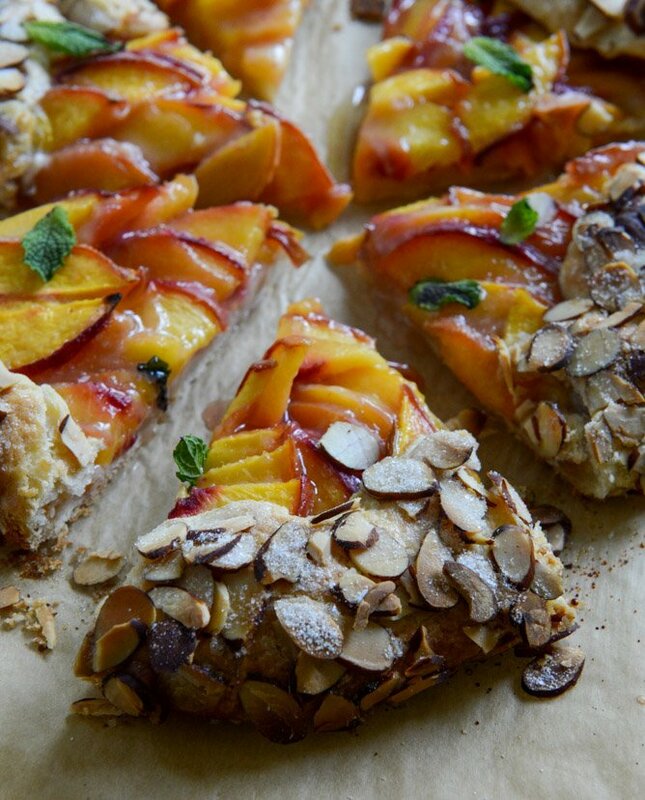 I love your combination of the peaches and almonds! 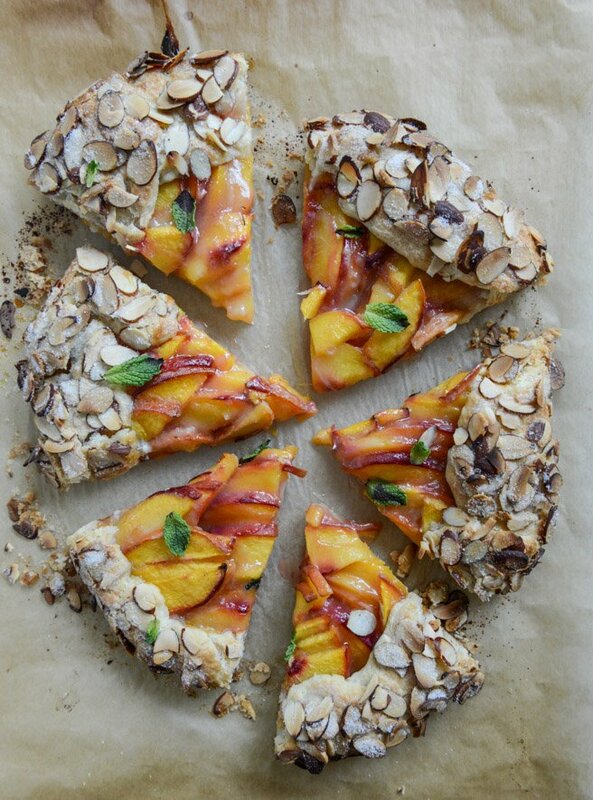 You turned a simple and boring peach galette into something deliciously gourmet!